Sarah Morris is Steinmetz Professor of Classical Archaeology and Material Culture. Morris' training and research involve the interaction of Greece with its Eastern neighbors, in art, literature, religion and culture. 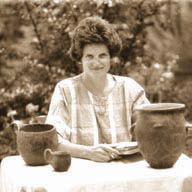 Her chief book on the subject, Daidalos and the Origins of Greek Art (Princeton, 1992) won the James Wiseman Book Award from the Archaeological Institute of America for 1993. She has also edited (with Jane Carter) a volume of essays, The Ages of Homer (Texas, 1995), on the archaeological, literary, and artistic background and responses to Greek epic poetry. A practicing field archaeologist, she has excavated in Israel, Turkey, Greece, and Albania, and is currently co-directing the Ancient Methone Archaeological Project in northern Greece. Her teaching and research interests include early Greek literature (Homer, Hesiod and Herodotus), Greek religion, prehistoric and early Greek archaeology, ceramics, Greek architecture and landscape studies, and Near Eastern influence on Greek art and culture.